Sega’s answer to Nintendo’s Mario Bros. was the speedy ball of energy known as Sonic the Hedgehog. The spiky-haired hedgehog caught on in the video game world and, like Mario, made the transition to animated series with ABC’s Sonic the Hedgehog and the syndicated The Adventures of Sonic the Hedgehog. 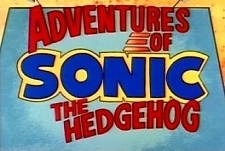 The Adventures of Sonic the Hedgehog emphasized comedy over the adventure aspects of the ABC show. In both series, Sonic battled the red-mustachioed baddie Dr. Robotnik and his army of henchmen, but this version features gags like Sonic’s dressing up in disguises any fool could see through and getting away with it. When the superfast hedgehog got his speed up, he balled up into a buzzsaw-like turbo roll, bowling over his enemies. Sonic’s video game partner, Tails the fox, joined up for the animated series as the perpetual sidekick who wanted to be the star. Jaleel White (TV’s Urkel) provided the voice of Sonic in both series, which debuted within a week of each other in the fall of 1993. The syndicated series lasted 65 original episodes, but Sonic and Tails continued their streak of popular video games on Sega's Genesis, Saturn, and Dreamcast systems long after the show left the air. 4.8/5 Stars from 101 users. Please give the Cartoon Series Adventures of Sonic the Hedgehog a vote between 1 and five stars, with five stars being the best, 1 being a show you absolutely hate, and a three for an average show. This Series has been viewed 4 times this month, and 9,622 times total. Adventures of Sonic the Hedgehog Episode Guide -DiC Ent @ BCDB by Big Cartoon DataBase is licensed under a Creative Commons Attribution-NonCommercial-ShareAlike 4.0 International License.